A workflow consists of a series of workflow steps. Each step defines a particular part of the recruitment process. For example, you might have a ''Share Candidate with Hiring Manager'' step to allow the recruiter to share the candidate with the hiring manager. In case the hiring manager does not approve of the candidate, the next logical step would be the ''Reject'' step in order to reject the candidate. The workflow steps take a candidate all the way from the start of the recruitment process to the eventual rejection/acceptance of the candidate. Workflow steps make the recruitment process convenient and uncomplicated for the recruiter. If you are not familiar yet with the workflow object, I would recommend to read our article about Workflow first. How to create a new workflow step? 1. Navigate to the Connexys Resource Manager Setup. 2. In the Advanced setup section, click on Workflow steps. This will take you to the list with all your organizations current workflow steps. 3. To create a new workflow step, click on New Workflow step. Unique number - The application requires you to fill in a unique number here. This does not directly affect anything on the user level of the application. Step Name - This field defines the default name for the workflow step. Icon - This field defines what icon will appear in the workflow for this step. Record type name - This field defines the relevant record type. This is only required if you want to show picklist fields that are dependent on record type. Return page - If you want to return to a certain page after running an event coupled to a workflow step, pick the desired Return page from the drop-down list. Always allowed - By checking this box, you allow for the user to always make this step, regardless of the current workflow status. In case the step is not defined in the current workflow status, taking the step will not result in a new workflow status automatically. Instead, the user will be asked to decide the new workflow status. Show as workflow button - Checking this box will create a workflow button for this step on the workflow screen, as seen in the image below. Default value contact - This field defines who is the default contact for the workflow step. Send email to candidate unchecked? - When this box is checked, the option send email to candidate is unchecked by default. Send email to contact unchecked? - When this box is checked, the option send email to contact is unchecked by default. Send email to supplier unchecked? - When this box is checked, the option send email to supplier is unchecked by default. Supplier/candidate/contact email template - These fields define the email template to be used when sending out emails. There is a separate field for the supplier, candidate and the contact. You can connect multiple e-mail templates to a workflow step. If you want to have a default (specific) "Candidate" e-mail template selected when opening the workflow step, enter the name of this template in the field "Candidate email template" (or use the lookup field). This also applies for e-mail templates which are intended for a Contact or Supplier, in this case use the fields "Contact email template" or "Supplier email template"
The User who takes the step and isn’t one of the interviewers. The Recruiter, if the User is also an interviewer. No one, if the User and Recruiter are both the interviewers. 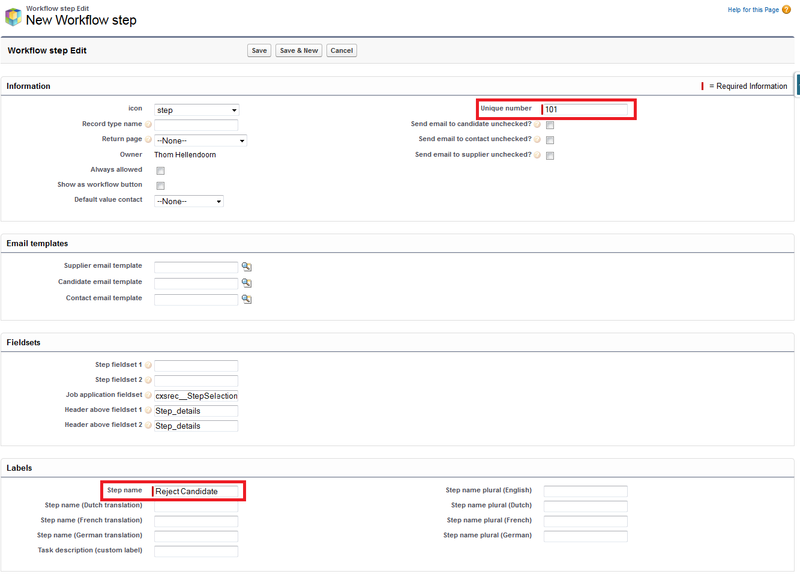 Step fieldset - Fieldsets can be used to specify which fields must be filled in by the user. Enter the name of the fieldset that you want to use. Job application fieldset - Enter the name of the fieldset that holds the columns you want to display in the table that is shown at the top of the enter step page. Header above fieldset - Enter the header (custom label) that must be shown on top of the fieldset. Step name (Dutch translation) - Translation of the step name in Dutch. Users that selected Dutch as their default Salesforce language will see this translation as the step name. Step name (French translation) - Translation of the step name in French. Users that selected French as their default Salesforce language will see this translation as the step name. Step name (Dutch translation) - Translation of the step name in Dutch. Users that selected German as their default Salesforce language will see this translation as the step name. Step name plural (English) - Enter the plural form of the step name. Step name plural (Dutch) - Enter the plural form of the adequate translation. Step name plural (French) - Enter the plural form of the adequate translation. Step name plural (German) - Enter the plural form of the adequate translation.